We were a group of four that all love Norseman, the course and everything about it. We have all been heavily involved during the history of the race. The four of us that tested and perhaps pioneered real winter triathlon was Fredrik Mandt, Øyvind Lillehagen, Jan-Sigurd Sørensen and myself. This was an old dream, an expression of love to Norseman, love to triathlon and to the beautiful sport of real winter triathlon. The trip had to be postponed due bad conditions, which in terms of winter triathlon means to warm weather. But at the end of March, the weather turned cold again and we got the rough conditions we needed. We were delayed a bit, because the mountain was closed to all traffic for a few days, for the snow plow trucks to clear the road. It was only open for 24 hours before they had to close it again. Luckily we managed to get to Eidfjord, swim and bike back before they closed it again. 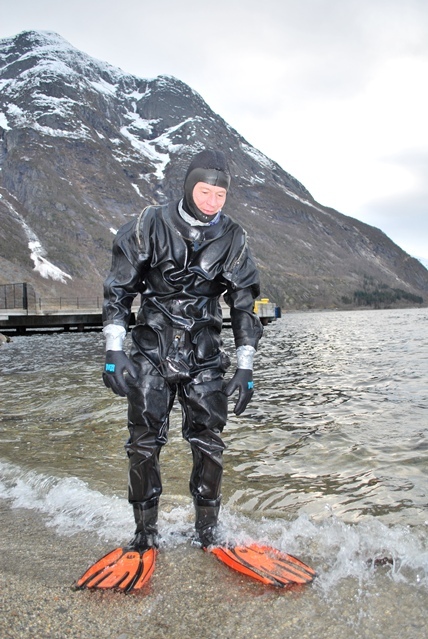 We borrowed the dry suits from the Norwegian army and the rest of the swim gear from Spiro Service in Langesund. We didn’t test it before we entered the water in Eidfjord, so we were rather excited to find out if it kept the water out. It did and we kept dry and rather warm during the two hours in the water. But for first-timers with no instruction, it was terribly difficult to swim. We swam like bananas, and we needed to constantly switch between back stroke and free stroke to avoid cramps. We later had to pay the prize for the silly swim form when we came to the run part. The bike through the mountain plateau Hardangervidda was a fantastic experience. We passed during the night to avoid traffic, so it was only us, our wonderful support, and the snow plow trucks. The truck drivers were gentle to us. The conditions were perfect winter. We used mountain bikes with spikes, and the ice and snow never was a problem. The temperature was 5 to 10 degrees minus (C), which is probably perfect for biking during winter. We sweated uphill and froze downhill, so leaving the bike in T2 was nice. The bike leg took us 12,5 hours. When we arrived at T2 in Austbygde, our run legs where rather different from they use to be. We ran ok the first 17 km’s, then things turned ugly. And guess what. Zombie Hill lived up to its name this day. We expected to be in better condition, but the trip was hard for us, even if we were rather comfortable most of the time. Øyvind and Jan-Sigurd’s legs stopped working, so they had to call it the day after 28 and 35 km’s. Fredrik and I were able to finish at Mt Gaustatoppen at just under 24 hours. It was very windy but beautiful as always. We even got the lift back down from the mountain. This event was not sanctioned by Norseman Xtreme Triathlon. This was not a test of a future concept. It was an old dream, an expression of love to Norseman, love to triathlon and to the beautiful sport of real winter triathlon. Fantástica experiência, parabéns pela iniciativa.